Metals News - First Vanadium Corp. Delivers Strong Maiden Resource Estimate, Buying Opportunity? First Vanadium Corp. Delivers Strong Maiden Resource Estimate, Buying Opportunity? Not all vanadium projects or vanadium juniors will make it to Pre-Feasibility Study (“PFS”)–stage. In fact, most of them won’t. That should be no surprise. Yet, on the other hand, readers may have noticed that the number of vanadium juniors is growing. So, yes, for most, this will end in tears. Still, there must be some quality companies and projects that have a decent shot of reaching production, right? I believe so. 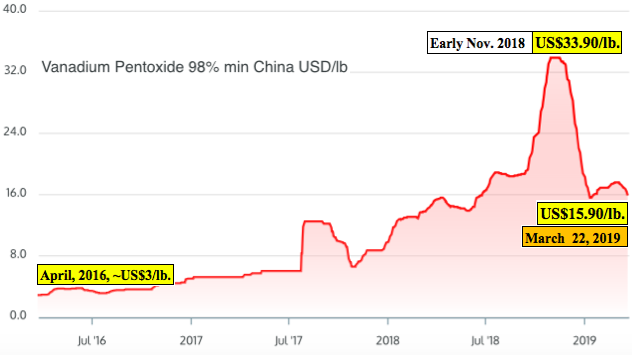 Vanadium companies I would consider must have one or more projects with a good vanadium pentoxide (“V2O5“) grade, because we’ve seen how volatile that metal price can be. Over the past 2 years, it has rocketed from ~US$3/lb. to nearly US$34/lb., and is now resting at US$15.90/lb., but experts I speak with say this is a healthy price. A mediocre grade might not cut it at US$10/lb. pricing. And, projects of merit must have fairly large scale, or at least the potential for large scale. Vanadium companies I would consider must have strong management teams. Not just successful capital raisers, but senior people, engineers, geologists, project managers, execs with Big company experience. Seasoned professionals who have worked globally, in good places & bad, with different commodities. Vanadium companies I would consider must be attractively valued and have clean capital structures. Most companies will claim that they have good access to key infrastructure, not all are telling the truth! Finally, I want a project that can comfortably be in production within 3-5 years. A company that ticks off many boxes is First Vanadium Corp. (TSX-V: FVAN) / (OTCQX: FVANF). It just delivered a Maiden mineral resource estimate on a Project it has an option to earn a 100% Interest in. The Project is in Nevada, it has a strong management team, Board & Advisors, a sizable resource (303 M pounds Indicated) with room to grow, a good grade, especially for a near surface deposit (80% of the resource is in the Indicated category at 0.615% V2O5) and world-class infrastructure. Management claims that First Vanadium’s Carlin Vanadium project hosts North America’s largest, highest-grade primary vanadium resource. Best of all, the Carlin Vanadium project could possibly be in production in ~4 years (my estimate only). The Company has a pristine capital structure with just 39 M shares outstanding, zero debt & C$1.5M in cash. There are 7.5 million in-the-money warrants that could bring in another C$2.5M. This Company is for real and they mean business. Further, I think that First Vanadium has the right team in place to move the Carlin Vanadium project forward. This is an exceptional group with deep senior roots in the industry. 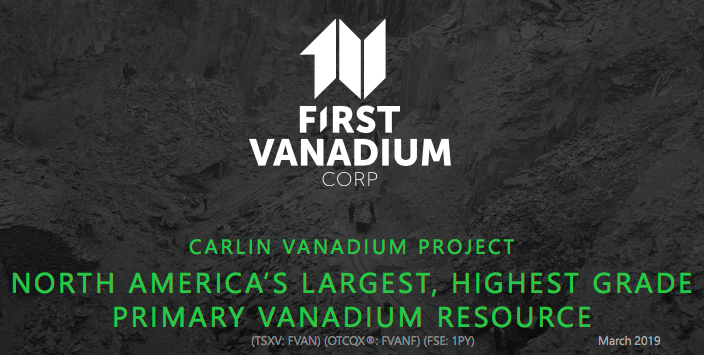 The Carlin Vanadium project consists of un-patented mining claims covering 3,177 acres in North-Central Nevada, 6 miles south of the town of Carlin on Highway I-80. The Company recently more than doubled its footprint by staking 1,846 additional acres over Federal lands adjacent to the original core claims. The incremental parcel was picked up for infrastructure, engineering design & development purposes. It adds flexibility and additional planning options. They are obviously thinking ahead. The Project has exceptional infrastructure. It is road accessible from the towns of Carlin & Elko. Carlin is a major rail hub to both coasts. Power is < 5 miles away. The Project was explored & drilled by Union Carbide Corp. in the late 1960’s, resulting in a defined resource from over 100 historical drill holes. In 2010, an NI 43-101 compliant resource estimation was made on the Carlin Vanadiumdeposit by SRK. The results were an Inferred Mineral Resource at a Cut-off grade of 0.3% V2O5 for 289 M pounds at 0.515%. This has been updated and improved just last month by First Vanadium. The additional drilling by First Vanadium firms up a high-grade vanadium zone ~35 m thick (~115 ft.) running north-south over ~1,800 m (~5,910 ft.) in length, and averaging ~600 m (~1,970 ft.) across. The mineralized zone outcrops at surface, but is mostly found at shallow depths between 0 to ~60 m (0 to ~197 ft.). A new (Maiden) mineral resource estimate was delivered in late February, 2019 at a cut-off grade of 0.30% V2O5. It contains 303 million pounds vanadium (V2O5) in the Indicated category at a grade of 0.615%, plus 75 million pounds V2O5 in the Inferred category at a grade of 0.52%. 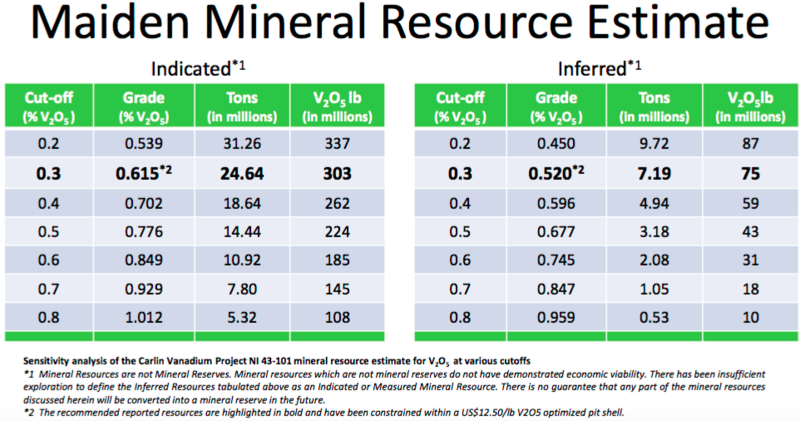 Considering a higher cut-off grade of 0.80% V2O5, the Carlin resource contains an estimated 108 million pounds V2O5 at a grade of 1.01% V2O5. And, management believes that there’s the potential, subject to more drilling, to increase the size of the resource by 50% or more. Catalysts between now and a 4th quarter PEA would likely include; metallurgy results – finalizing flow sheet & process, defining extractions & recovery rates — identifying saleable products with quality specifications. Drilling – to increase the size of the resource, but chiefly to convert Inferred V2O5 to Indicated. Management believes that can be done very cost effectively and would benefit a PFS. Permitting – the Company hopes to be granted a Plan of Operations permit soon allowing for a larger surface disturbance. In coming months and concurrent with the PEA, initiate the permitting process for an Environmental Assessment. It’s hard to overstate the importance of exploring and potentially developing a vanadium project in the U.S., with the President having named V2O5 a “strategic mineral,” and the very significant and growing need for vanadium in steel, the backbone of global growth, and the emerging Vanadium Redox Flow Battery market. The current U.S. Administration has pledged to streamline and cut the red tape from the permitting & approvals of projects containing strategic minerals. And, the Federal tax rate has been slashed to 21%, which will really help the PEAs of U.S. based projects! 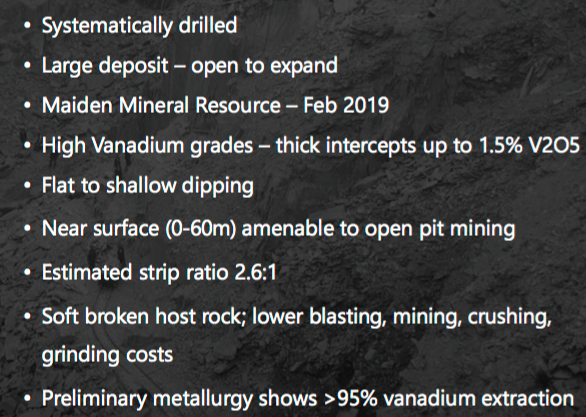 The opportunities for First Vanadium are vast with the good grade, shallow deposit and the moderately large size, but there are also risks as they are still pre-PEA. One such risk is the vanadium price. Although it climbed to nearly US$34/lb. less than 6 months ago, it is now less than half that, US$15.90/lb. Metallurgy is another risk, there has been limited news on this front since mid-2018, but management says this should be addressed in the next few months. In the table below are several vanadium companies ranging from exploration to one company in production, Largo Resources. It is difficult to find close comps because other vanadium juniors also have non-vanadium projects, and/or market caps below C$10 million, or are too early stage, (no drilling), or in production like Largo (too advanced). Largo offers readers a good proxy for the underlying vanadium price, the same way that Albemarle & SQM do for lithium. From the table, for each share of First Vanadium, investors get 9.7 pounds of V205. Compare that to the average of the other players, at 2.6 pounds/share. Of the peers, only Western Uranium & Vanadium has an attractive share structure, with 26 million shares. This brief commentary suggests that First Vanadium could be meaningfully undervalued by the market. The Company expects to have a PEA completed by the 4th quarter. At that time, metallurgical testing will have been completed and possibly an updated mineral resource estimate will have been booked. In my mind, that sets the stage for an attractive PEA. Upon delivery of a PEA, strategic investors like funds, institutions and even off-take partners could start taking a closer look, if they haven’t already. News of inquiries from interested parties, and ongoing de-risking and growth of the Carlin Vanadium resource, should attract the attention of investors interested in battery metals. As the year progresses, the market will become aware of which companies have something and which don’t. Investment dollars will flow to the haves from the have nots, and I strongly believe that First Vanadium Corp. will be a prime beneficiary of that flow of funds. Disclosures: The content of this article is for information only. Readers fully understand and agree that nothing contained herein, written by Peter Epstein of Epstein Research [ER], (together, [ER]) about First Vanadium Corp., including but not limited to, commentary, opinions, views, assumptions, reported facts, calculations, etc. is not to be considered implicit or explicit investment advice. Nothing co-ntained herein is a recommendation or solicitation to buy or sell any security. [ER] is not responsible under any circumstances for investment actions taken by the reader. [ER] has never been, and is not currently, a registered or licensed financial advisor or broker/dealer, investment advisor, stockbroker, trader, money manager, compliance or legal officer, and does not perform market making activities. [ER] is not directly employed by any company, group, organization, party or person. The shares of First Vanadium Corp. are highly speculative, not suitable for all investors. Readers understand and agree that investments in small cap stocks can result in a 100% loss of invested funds. It is assumed and agreed upon by readers that they will consult with their own licensed or registered financial advisors before making any investment decisions. At the time this article was posted, Peter Epstein owned no shares of First Vanadium Corp. and the Company was an advertiser on [ER] . Readers understand and agree that they must conduct their own due diligence above and beyond reading this article. While the author believes he’s diligent in screening out companies that, for any reasons whatsoever, are unattractive investment opportunities, he cannot guarantee that his efforts will (or have been) successful. [ER] is not responsible for any perceived, or actual, errors including, but not limited to, commentary, opinions, views, assumptions, reported facts & financial calculations, or for the completeness of this article or future content. [ER] is not expected or required to subsequently follow or cover events & news, or write about any particular company or topic. [ER] is not an expert in any company, industry sector or investment topic.